Normal scores help to compare attributes of individuals to a representative population and to determine if the scores lie within the normal range or if they are exceptional. The conversion of individual test results into normal scores is usually based on the assumption that personal traits or abilities are normally distributed within the population. This means that many people have scores around the arithmetic mean and only few people have scores deviating extremly from the population mean. Normal distributions are characterized by their mean M and their standard deviation SD. The standard deviation is a measure for the variability within the distribution (i.e. its width). A normal score is the individual distance of the population mean quantified in terms of standard deviations. There are a number of different norm scales. They all more or less yield the same information and can directly be transformed into each other. Probably the most well known scale is the IQ scale with a mean of 100 and a standard deviation of 15. A score of 100 means that the result is completely on average. 115 and more is usually referred to as above average, under 85 is below average. The scores may as well be reported as z-scores (M = 0, SD = 1), T-scores (M = 50, SD = 10), Standard Values (SW score; a norm scale used in German speaking countries; M = 100, SD = 10) or Centil scores (M = 5, SD = 2), and even in quite a number of other scales. Percentiles, on the other hand, provide a different kind of information. They specify, which percentage of the norm population scores equal or worse. A percentile of 50 means that 50% of the norm population score equal or worse. A person with percentile 50 therefore shows an average result. Higher scores indicate a better result, lower scores a worse one. The Norm Scale Calculator simplifies the conversion of the different scales. Either you can directly type scores into the text fields and the calculator does the transformation, or you can drag the slider to the desired score ( User Guide). The Norm Scale Calculator is integrated into our different scoring software products by default, e. g. the scoring software for KABC-II, WPPSI-IV, WISC-V and WAIS-IV (German adaptations only). Additionally, you can calculate the age of the person at the test date. You can find a more detailed overview of the programm function in the Online-Help. The Norm Scale Calculator may be used free of charge for privat or vocational activities (e.g. as psychologist, therapist ...). The software and any authorized copies that you make are the intellectual property of Psychometrica. You agree to hold Psychometrica harmless from any and all liabilities, losses, actions, damages, or claims (including all reasonable expenses, costs, and attorneys fees) arising out of using the software if they are not deliberately intended or caused by grossly negligent behavior of Psychometrica and its suppliers. We do not grant you the right to sublicense or distribute the software. You may not modify, adapt, translate or create derivative works based upon the software. You will not reverse engineer, decompile, disassemble or otherwise attempt to discover the source code of the software except to the extent you may be expressly permitted to reverse engineer or decompile under applicable law. 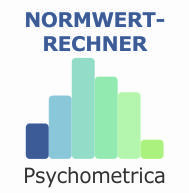 If you like the program, we would appreciate if you could set a link on a homepage, in a blog or a forum pointing to the download page of the Norm Scale Calculator (http://www.psychometrica.de/normwertrechner_en.html). For this, you can use the following piece of HTML code. Please click 'Highlight' and press STRG-C to copy the text to the clipboard. The version for Windows is an exe file, the jar is an platform independent executable. Please save the desired file on your computer an start it with a double click. If you wish to install the software, please use Webstart. Depending on the version of your Java platform, you might receive a warning message, because it is a piece of software from the internet. It is save to use it and it only stores its settings on your computer. If this troubles you, you might as well use the Online-Calculator though. The Norm Scale Calculator needs an installed Java Runtime Environment (Version 6.0 or higher) on the computer. If Java is not yet installed, it can be obtained for free via http://java.com/. * The Norm Scale Calculator uses JFreeChart and JGoodies FormLayout for the visualization of the normal scores. The date input fields is done via JCalendar. The chart of the online calculatur is generated with Chart.js.